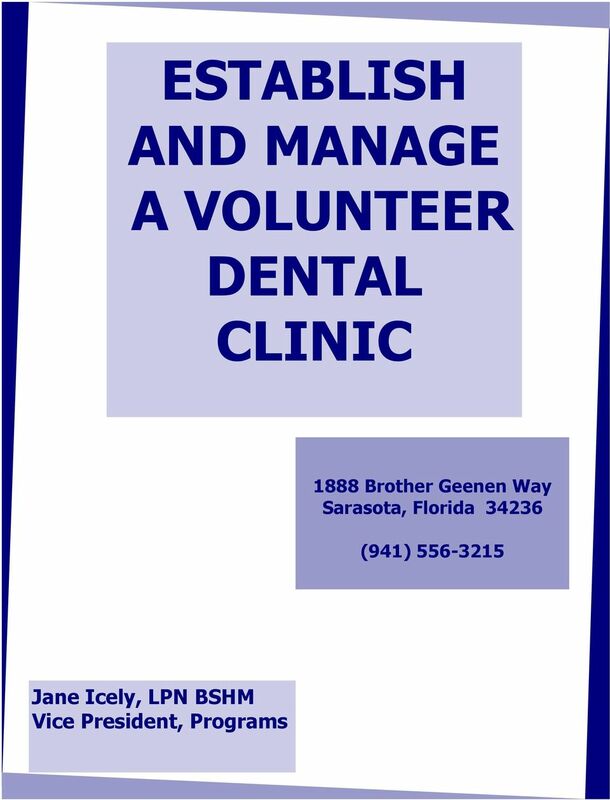 Download "ESTABLISH AND MANAGE A VOLUNTEER DENTAL CLINIC"
2 Florida Statutes Provide: 1. 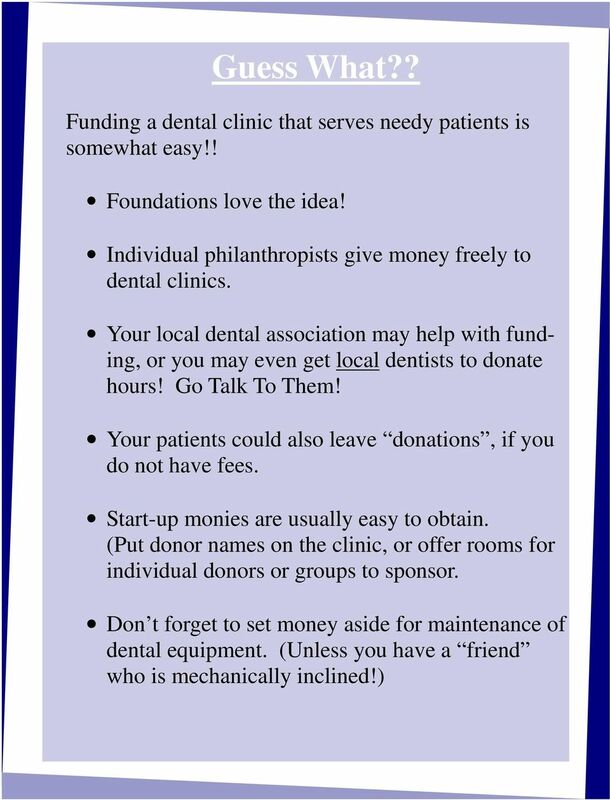 For a non-profit dental permit A. To be renewed yearly. B. 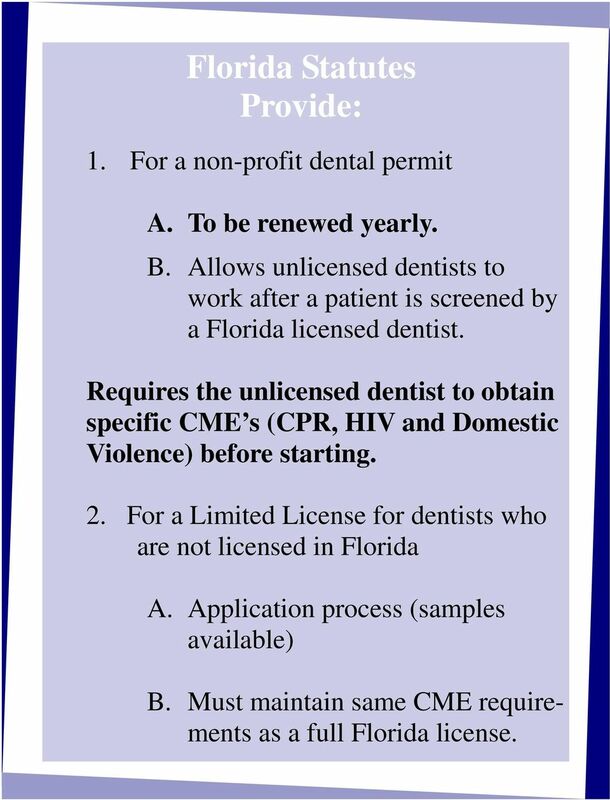 Allows unlicensed dentists to work after a patient is screened by a Florida licensed dentist. Requires the unlicensed dentist to obtain specific CME s (CPR, HIV and Domestic Violence) before starting. 2. 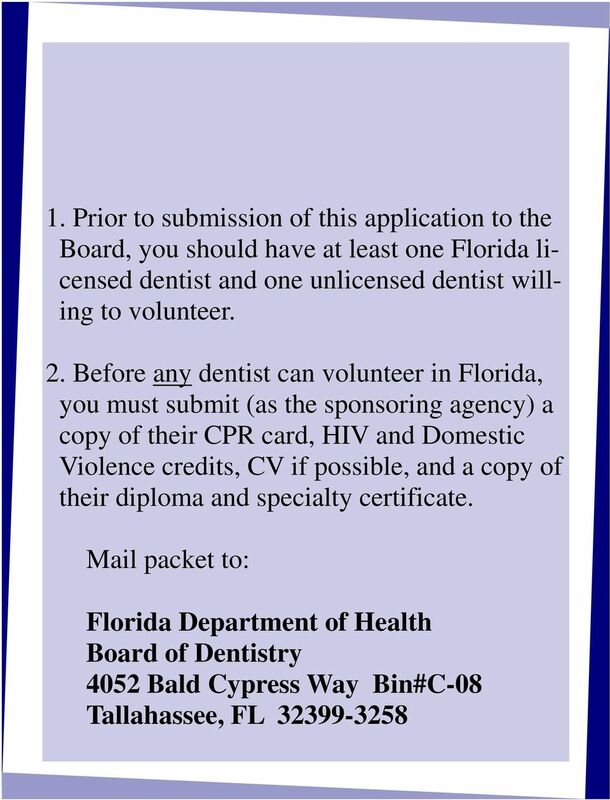 For a Limited License for dentists who are not licensed in Florida A. Application process (samples available) B. Must maintain same CME requirements as a full Florida license. 3 To Obtain a Non-Profit Corporation Permit (Fl. St. 64B ) 1.You must submit a copy of the non-profit s charter, and proof of registration with IRS as a non-profit. 2. 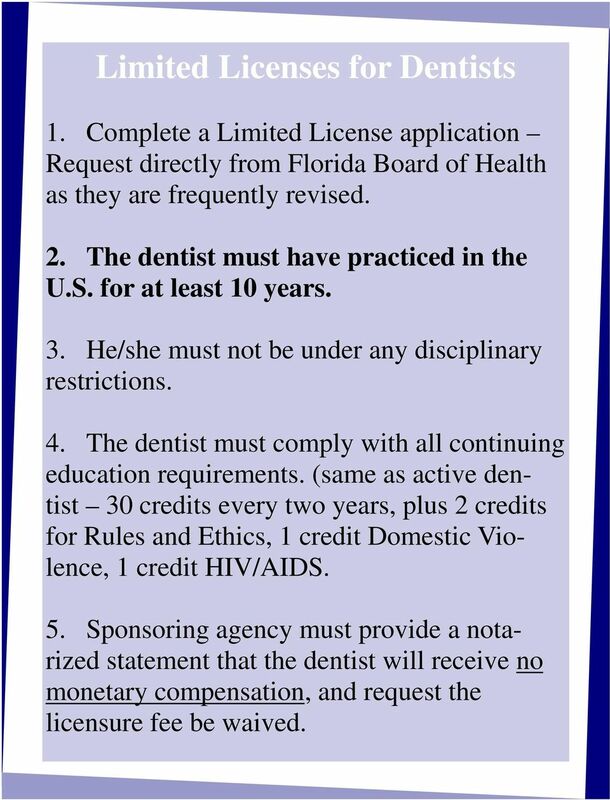 Justification for need to provide dental services by dentists not licensed in Florida. 3. 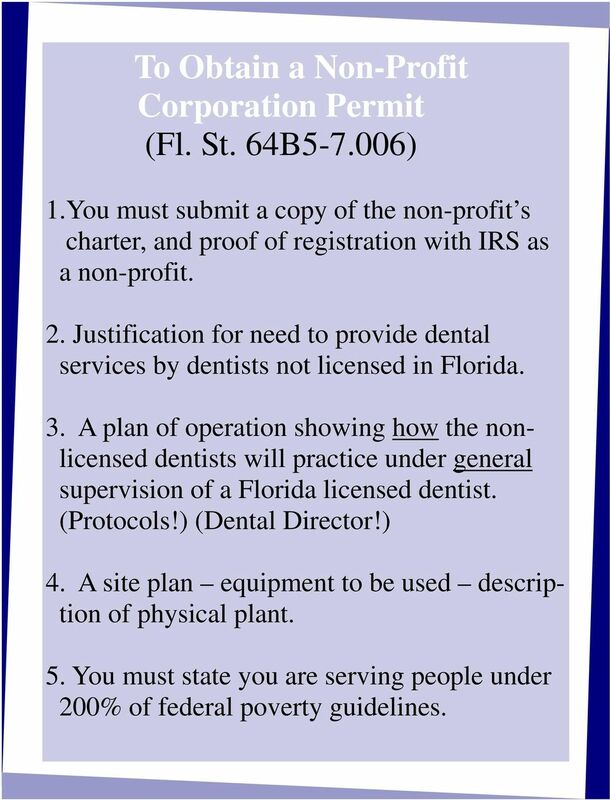 A plan of operation showing how the nonlicensed dentists will practice under general supervision of a Florida licensed dentist. (Protocols!) (Dental Director!) 4. A site plan equipment to be used description of physical plant. 5. You must state you are serving people under 200% of federal poverty guidelines. 5 Limited Licenses for Dentists 1. 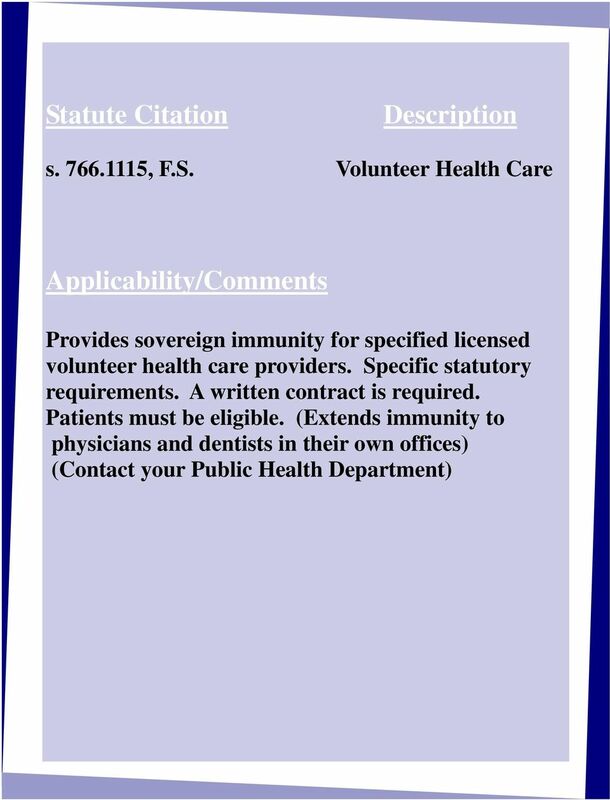 Complete a Limited License application Request directly from Florida Board of Health as they are frequently revised. 2. The dentist must have practiced in the U.S. for at least 10 years. 3. He/she must not be under any disciplinary restrictions. 4. The dentist must comply with all continuing education requirements. (same as active dentist 30 credits every two years, plus 2 credits for Rules and Ethics, 1 credit Domestic Violence, 1 credit HIV/AIDS. 5. Sponsoring agency must provide a notarized statement that the dentist will receive no monetary compensation, and request the licensure fee be waived. 6 1. Limited licensees may only serve the indigent population. (under 200% federal poverty level) 2. Limited license dentists may obtain a DEA license and write prescriptions. 3. 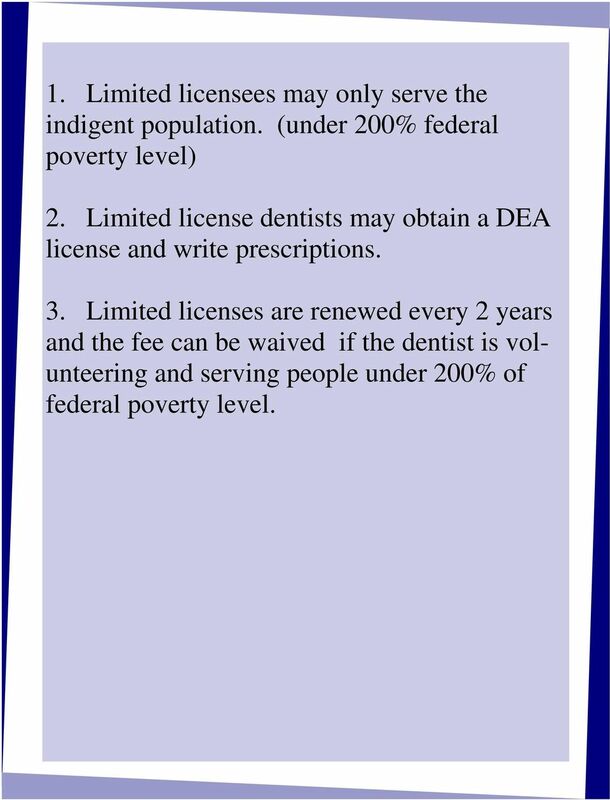 Limited licenses are renewed every 2 years and the fee can be waived if the dentist is volunteering and serving people under 200% of federal poverty level. 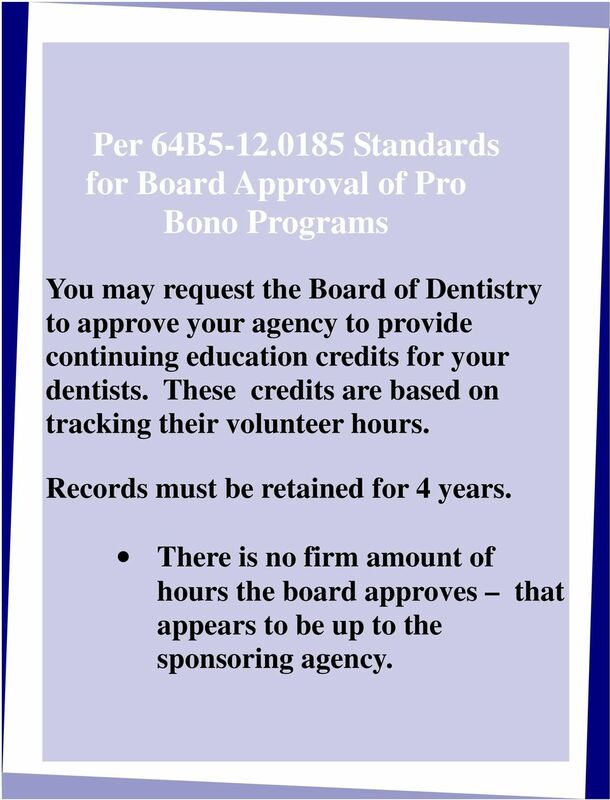 7 Per 64B Standards for Board Approval of Pro Bono Programs You may request the Board of Dentistry to approve your agency to provide continuing education credits for your dentists. These credits are based on tracking their volunteer hours. Records must be retained for 4 years. There is no firm amount of hours the board approves that appears to be up to the sponsoring agency. 10 Related Statutes Statute Citation Description s , F.S. Good Samaritan Act Applicability/Comments Immunity from civil liability. Provides that any person providing emergency care, shall not be held liable for civil damages. Also applies to non-profit medical facilities, and health screenings. Reasonably prudent standard. 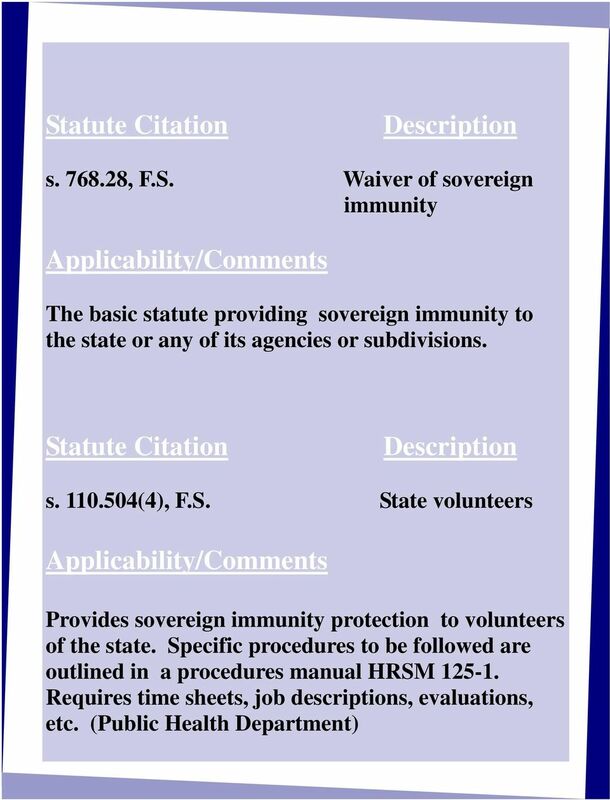 Statute Citation Description s , F.S. 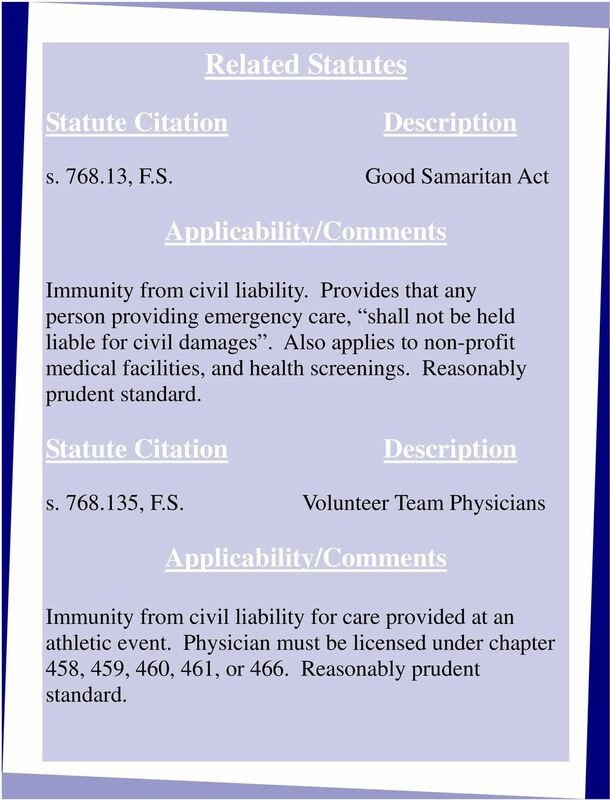 Volunteer Team Physicians Applicability/Comments Immunity from civil liability for care provided at an athletic event. Physician must be licensed under chapter 458, 459, 460, 461, or 466. Reasonably prudent standard. 11 Statute Citation Description s , F.S. 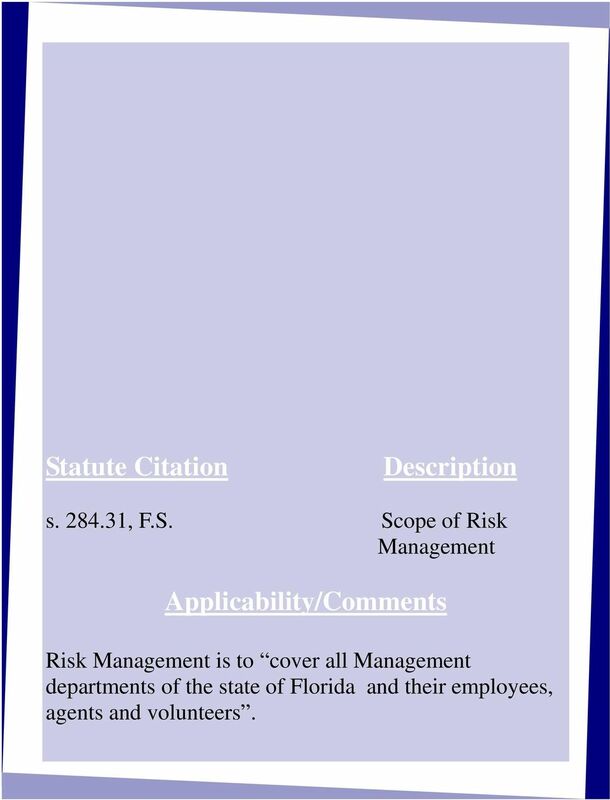 Scope of Risk Management Applicability/Comments Risk Management is to cover all Management departments of the state of Florida and their employees, agents and volunteers. 12 Equipping a Dental Operatory BASICS: 1. Chair 2. Light 3. X-ray machine (is inspected yearly) 4. X-ray developer 5. Dental unit including handpiece and suction 6. Extra handpieces (need cleaning/sterilizing between patients) 7. Autoclave 8. Prophy instruments (mirror, explorer, scaler) 9. Extractors (different styles and angles, depending on which tooth) 10. 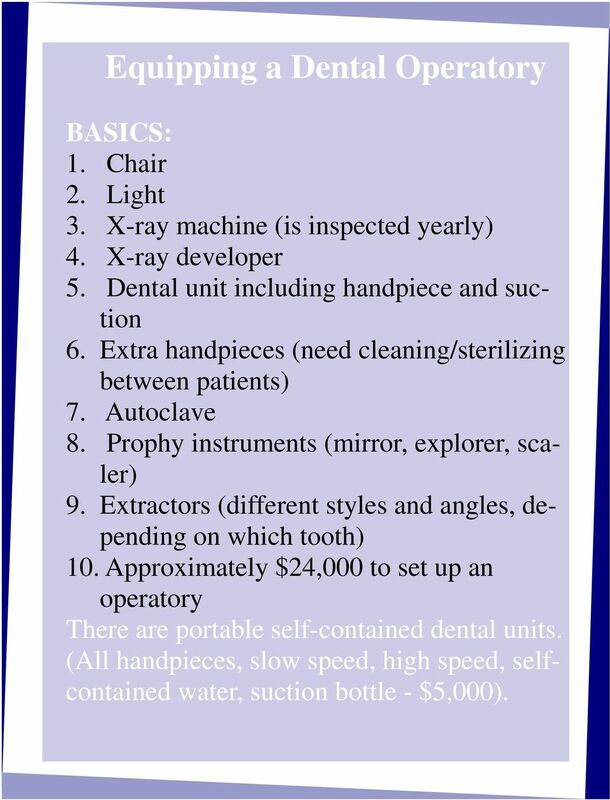 Approximately $24,000 to set up an operatory There are portable self-contained dental units. (All handpieces, slow speed, high speed, selfcontained water, suction bottle - $5,000). 13 Remember! Anyone with a background in Health Care can work as a dental clinic aide. 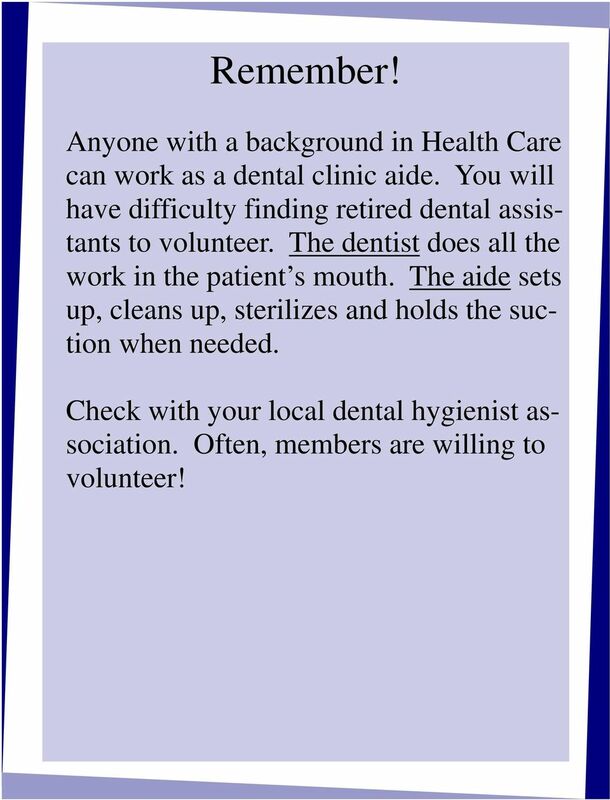 You will have difficulty finding retired dental assistants to volunteer. The dentist does all the work in the patient s mouth. The aide sets up, cleans up, sterilizes and holds the suction when needed. Check with your local dental hygienist association. Often, members are willing to volunteer! 15 Conclusion Start small, one Operatory, a couple of dentists, one part-time coordinator (can be a nurse). All other clinic staff can be volunteers. 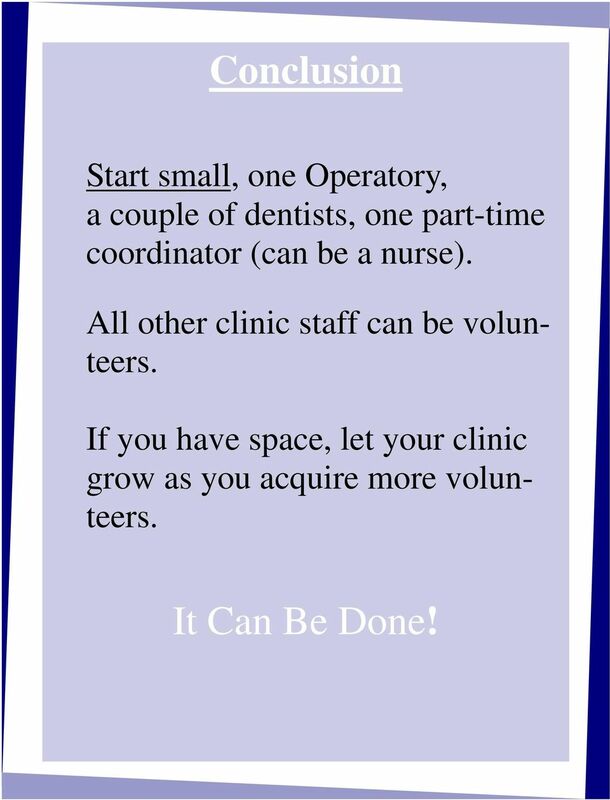 If you have space, let your clinic grow as you acquire more volunteers. It Can Be Done! 16 Remember! 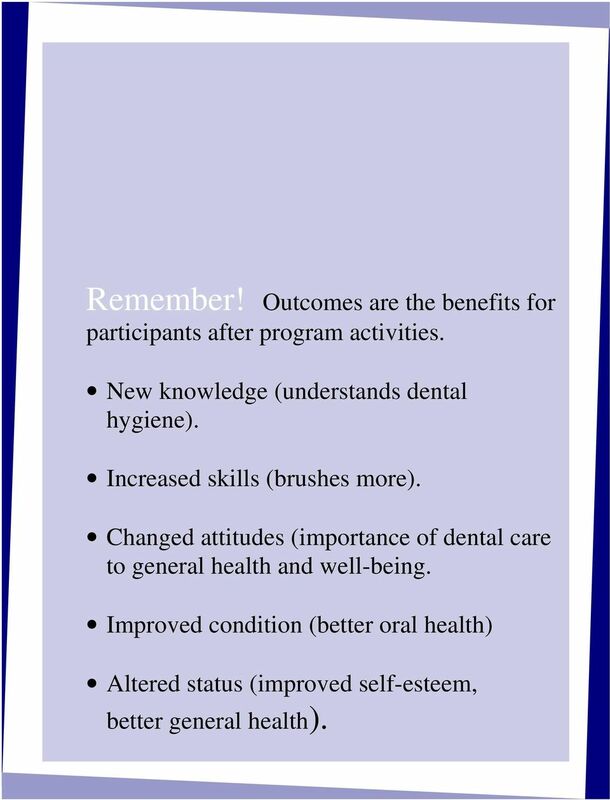 Outcomes are the benefits for participants after program activities. New knowledge (understands dental hygiene). Increased skills (brushes more). Changed attitudes (importance of dental care to general health and well-being. Improved condition (better oral health) Altered status (improved self-esteem, better general health). APPLICATION FOR DENTAL HYGIENE EXPANDED PRACTICE PERMIT PATHWAY 1 DENTAL HYGIENIST $75.00. Name License No. Mailing Address. Yes No No License verification. AADE query. AR Yes Five years No No No License verification. References. No background fee. Education.